On March 11, 2011 I was sitting in a coffee shop in Berlin, dressed appropriately in a black turtleneck and leather jacket, reading about the terrible Fukushima Daiichi Nuclear disaster. The next day I read that the German government was pushing for “Atomausstieg,” which is German for “let’s retire all nuclear generating capacity.” 80% of Germans surveyed were in favor of this move. The nine remaining German nukes are being phased out and the last one will shut its doors by 2022. The Energiewende Law, which was proposed only months before the Fukushima disaster, was enthusiastically approved in 2011 and has led to rapid growth in the penetration of solar PV and wind power across Germany, as the advertising below indicates. While there is no way to establish causality here, no one can argue with the fact that the installed cost of PV has come down by 66% in a decade. And the creation of the German market could have had something to do with this. In 2012 Germany (1.1% of the world’s population) had 32% of installed solar capacity globally, according to government figures. And capacity continues to grow – 2014 installed capacity was 113% above that in 2010 suggesting a 21% growth rate p.a. This has come at a cost. While owners of PV installation have to pay for some of the cost of the solar panels privately, the average German household now pays about 260 Euro per year to subsidize renewables, which is nothing to sneeze at. But it’s also not the end of the world as some have suggested (about the equivalent of a Starbucks latte twice a week, which unlike the renewable subsidy, does not come with a green halo). 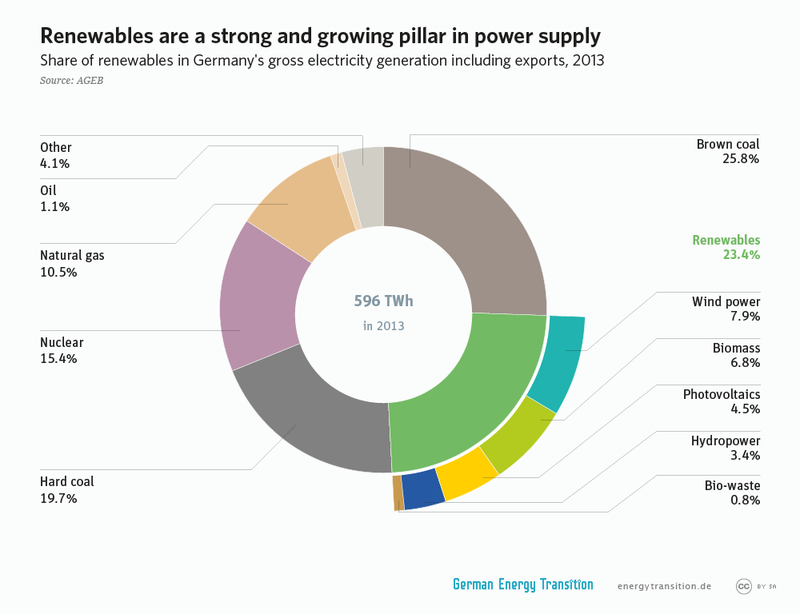 The Energiewende enjoys less, but still strong, public support. So now the government is starting to contemplate what to do next to achieve its ambitious emissions reduction goal of 80% by 2050. What we are seeing here is the huge variability in generation of renewables, which of course does not line up quite as beautifully with demand as has been pointed out elsewhere. This picture also shows nicely that by 2020 renewables are generating more power than is demanded (at least on the weekends). And if the installation trend continues, this will be true for most weekdays, too. This means that we may not need the always-on baseload (coal and nuclear in most places). In one version of the world you use fossils that ramp up quickly to meet residual demand (e.g., gas from Russia). In a second version of the world you use clean hydro power from Northern Europe instead. In a third version, which is the one Elon Musk would like you to consider, you use a giant battery in your house, which stores renewable power at times when there is plenty of it to be had for cheap (requiring a pricing revolution). I am a confessed hip-/techie. I like the last version of the future. But I have some questions. Is Germany this bold since it can always buy cheap nuclear baseload from France if things go terribly wrong? What if you are a country like the US, where you do not have this type of backup at scale? What about the political economy of a coal exit? Coal mining unions are very powerful and this would put a lot of people in poor areas out of jobs. And miners will not go into installing PV panels on people’s roofs, since the sunny rich areas are not usually where the coal mines are. How much storage do we need to make this work? I can see a residential model, where Elon Musk sells me a battery or my car serves as storage. But what about BMW, Porsche, and Intel? Will we come full circle where firms will have their own fossil backup generation (which is the case for most manufacturers in China currently)? What if the major players exit coal? That shift in demand, drives down price and leads to consumption elsewhere. In order to make this work you would have to exit coal and find a way to leave what you don’t consume in the ground. While writing this blog post I was surprised by how similar California’s and Germany’s energy policies and challenges are. Both places are pushing hard for an almost fossil free future using a combination of market based policies and huge number of competing standards. Both places have political leadership proposing radical long range policy targets, which we do not necessarily know how to achieve. Both places are relatively wealthy. Both places have industries that have been at the forefront of technological innovation, especially in the STEM fields. Germany, specifically, has been at the forefront of pushing new distributed generation technologies and shouldering much of the cost of the global energy transition. This is laudable. California is along for the ride and doing its part. It looks like we might be the ones leading the charge on designing cost effective storage. Thanks Elon. While I don’t think a coal free Germany is necessarily an unrealistic idea, I want us to keep our eye on the prize. What we should shoot for are drastic global reductions in CO2. Germany and California are small. If what comes out of our policies is a way to drive coal and natural gas up the merit order in places like China and India, this would be the real success. Previous Previous post: What Put California at the Top of Residential Solar? Ouch ouch ouch! It pains me when people write about the Energiewende without doing their homework. Even people who want to be supportive cause me pain, let alone the many ill-informed attacks out there. Especially when they have already found their way to the excellent EnergyTransition.de web site, which has all the facts, but then not sufficiently studied the site to learn what has happened and is happening. First, the “Energiewende law” was not “proposed months before Fukushima.” The Feed-In Act was adopted in 1991, with significant reforms by the Renewable Energy Act (EEG) in 2000, followed by more revisions in 2004, 2009, 2012 and 2014. Problem number two, how can Germany “always buy cheap nuclear baseload from France if things go terribly wrong?” Don’t you think this power is already spoken for in France? Do you think the plants are sitting there idle? The biggest solution will be greater EU integration of grid operations. In the same way California is solving variability first by integrating with the Western US grid. Lastly, the vision of a system with little or no nuclear and coal is not “slowly emerging.” It was established years ago in the decision to go to 80 percent renewables. That is, in fact, the whole point of the Energiewende. I’ve got more on German power issues, relative to US market policies, at my site PowerMarkets.org. Criticism is always welcome here as is advertising for other folks’ blogs. I enjoyed paging through your blog. Let’s start with your criticism 1. I know this. Everyone does. What I was referring to and should have linked to is this document. Criticism 2: Power in 2020 is not spoken for today. Another commenter shows data on the tremendous trade in French nuclear across Europe’s borders. This is why we have power markets. Criticism 3: You are citing one of your funder’s arguments, which might well be right. Greater integration is better. But there are many issues left unsolved (getting wind from North to South) which will require both greater physical and non-physical integration. Lastly Criticism: Sure. We could argue over how we define slowly. Gabriel used the word, but has not written it down as far as I can tell. I have made some feeble attempts to estimate the required amounts of storage and they Re far beyond anything policymakers can imagine. Studies by the California ISO identify days during the spring in 2024 when minimum daytime supply exceeds demand by as much as 70 GWH per day. Absorbing the surplus would require 7 million Tesla Powerwall units at a cost In excess of $25 billion. To get rid of coal, gas and nuclear altogether would require perhaps 100 times as much storage to deal with seasonal swings in production. Even if one could find enough sites for pumped storage, the environmental costs of creating it would negate much of the environmental benefits associated with renewables in the first place. Politicians are moving fully speed ahead without doing even the simplest calculations to understand the scale and scope of the practical difficulties and costs associated with their policies, none of which require more than grade school arithmetic..
Jack – UC Berkeley researchers looked into this last year. See http://www.researchgate.net/publication/264996720_The_role_of_large-scale_energy_storage_design_and_dispatch_in_the_power_grid_A_study_of_very_high_grid_penetration_of_variable_renewable_resources. If I read it right, they assume no imports and exports to simplify analysis. If the wholesale price of the Tesla batteries is $3500 per 10 kW, then 22 GW would be $7.7 billion. But there are many cheaper forms of storage, not to mention demand response, EV integration, and regional interconnection. I have not seen the Berkeley study but I do need to suggest a correct toyour figures on batteries. The $3,500 price is for the Tesla battery pack without inverters or installation, and the packs are 10 kWH/2 kW units, so the costs are more than 5 times higher than you suggest- more like 18 million+ units at a cost of at least $60 billion, though I’m skeptical since 22% of average daily demand would seem too low to deal with seasonal peaks and valleys. Other forms of storage and substitutes therefore can make up some, but not all of the difference without requiring extreme changes in lifestyles and business practices for which acceptance is as yet unknown. I might have more to say on this after I read the Berkekely link, for which I thank you. Ben, there is no way to get to that link without telling a fib since I am not a researcher. Is there any other way to get to the report? We should think about another potential storage source that will be very low cost: automobiles. California has about 24 million autos. The average horsepower is about 190 HP which converts to about 140 kW. Let’s assume that an EV will be about 100 kW. Generally cars are parked about 90% of the time, which of course varies diurnally. A rough calculation shows that about 2,000 GW of EV capacity is available with EVs as 100% of the fleet. To get to 22 GW of storage, about 1% of the state’s automobile fleet would need to be connected as storage devices. That seems to be an attainable goal. The onboard storage largely would be free–there probably are some opportunity costs in lower charging periods that would have to be compensated. The only substantial costs would be in installing charging stations and incorporating smart charging/storage software. I suspect those are the order of tens of dollars per kW. Using EV batteries might be a low cost option for the grid operator, but where is the value proposition for EV owners? Cycling a better mor often reduces its useful life, which is a cost the EV owner bears. If history is any guide, the whole process of enrolling owners will be complex and onerous. So I’m not at all convinced that EV batteries can be used for both transportation and grid storage. If you can convince my wife to buy an EV and then convince her to allow the battery to be used for grid storage, I might view things differently. In other words, test this idea on real people. I think it’s going to be a very tough sell. Just hooking up an EV owner and not compensating them isn’t the idea. Rather the first step is to figure out what is the value? (Preliminary results from an NREL study to be released before the end of the summer is about $70 to $100/kW-year.) Then you assess what are the incremental costs to the EV owner in reduced battery life. (And note that batteries depleted 30% can’t be used for EVs any more but are still valuable for grid storage. We probably can build in-home racks that store and connect the depleted batteries.) Those become factors in determining the payments to the EV owners and their agents. As for enrolling them, it need not be cumbersome if it’s the default (opt-out) when buying a car or installing the charging station. (See all of the literature on the importance of opt-out vs. opt-in and status quo bias.) The auto dealer or charging administrator becomes the agent. Your wife might sign up and not even know it. The charging process could work much like the massive distributed computing projects that harness small parts of the idle processors across millions of personal computers. All of this becomes part of the transactive energy (TE) grid that Ed Cazalet advocates. Jack, the other link is this: blob:http://www.researchgate.net/c216f47d-350f-46cb-9134-0c6ecb250ee2. Though I’ve never seen a URL start with “blob.” If that doesn’t work, email me at benpaulos at gmail and I can send it to you. And thanks for the correction on kW vs kWH prices. Ben, I was able to track down a copy of the analysis but this is the first opportunity I’ve had to respond. For the time being I’m willing to accept that the 186 GWh figure is a reasonable approximation, give or take a few percent. Let’s round it up to 200 GWh to make the arithmetic easy. That’s still $140 billion at today’s prices for the Tesla Powerwall or $90 billion for pumped storage at today’s overnight capital costs. In the case of batteries, the cells will have to be replaced periodically. In the case of pumped storage, I doubt there are 30 environmentally acceptable sites capable of hosting a plant the size of Helms in the Western Interconnection, let alone in California. However this turns out, it’s going to be very expensive. It’s also worth noting that the analysis you refer to does not consider the reliability impacts of uncertain wind and solar production. I won’t claim that makes their results invalid, but just as uncertain availability of thermal plants drives the need for reserve capacity, uncertainty around wind and solar production (and the forced outage rates for storage) have some impact on the need for reserves. Is Germany bold? Well don’t forget that Germany still has 20+GW of natural gas fired units that currently are not really running due to low wholesale electricity prices, so there is some dormant base-load-able capacity left to replace coal. Albeit having a neighbor with 60+GW of nuclear and off-peak loads of <40GW also helps. In general our European neighbors would most likely be happy with a German coal phase out as this would push prices back up again from their low <35Euro/MWh levels. What if you don’t have spare capacity or import options? In the current system it’s likely that gas needs to step in if you want to get rid of coal. One will need the flexibility in a high renewable share system anyway. Storage would be nice but may still need some time. Who knows? The political economy of a coal exit? Lets split hard coal and lignite here. The majority of hard coal are imports (7.5 vs. 50.1 mn t in 2013) with about 15'000 jobs left in the German mining business. Most of the phase out already took place in the last decades as German hard coal had to be subsidized since the 1970s. On the lignite side I don’t have employment numbers at hand. But also the renewable industry is becoming big business by now. The turnover for German RES generators is about 14bnEuro and the investment volume in 2014 was ca. 19bnEuro; and a total of 370'000 employees in the RES sector. I assume the RES lobby is quite powerful by now as well. What is the emission effect if we exit? For a German exit not so bad. Again going back to the two sided game with hard coal and lignite: the 50mn t of import coal will show up somewhere else, so no win here. The 7.5mn t of own hard coal are gone for good as they are too expensive and need subsidies already. But the big deal would be the 180mn t of lignite. No export option due to low calorific value means a gain for our world climate. Nothing that compensates China or India, but also nothing that comes back biting us from somewhere else. thanks for the comment – I somewhat disagree that phase out of coal would get prices back up. I am sure that – and remember I work for RWE so I would simply LOVE your assumption – the price of the electron will go to zero in mid-term. Business model of central generation regardless of primary fuel will die. Sooner than many like to think. Electrons will become abundant and free of charge as renewables and batteries kick in. Coal exit won’t stop that and won’t push prices up for long. Will make the market more “sparky” in short term and traders would enjoy the volatility quite a bit. (Electricity will become a derivative of weather trading). If I had a say (I don’t, I know that) I would ensure electricity is as cheap as possible for now and set clear rules (of exiting conventional generation). Let market forces take control again and refrain from even more (opportunistic) market intervention. In May 2020, what is backing up the solar, wind, biomass and hydro? The color code is different. Is it storage or the conventional power? Thank you. I think that is exactly what the discussion is about and the choices we will make in the future. Germany’s Energiewende is extremely irresponsible, from both an economic and environmental perspective. It should not be admired under any circumstances. It should be regarded with contempt and mentioned solely for the purposes of advising other countries what not to do with their energy policy. Germany’s solar resource is quite poor (at best 1,100kWh/m^2 in the south of the country, compared to over 2,000 in most parts of California), making their obsession with solar all the more astonishing. German PV farms suffer from extremely low capacity factors, around 10 or 11%. German solar farms make about as much economic sense as a geothermal power plant in Ohio or a hydroelectric dam on the Danube. The German nuclear phaseout was completely irrational knee-jerk reaction, not unlike when the public decides to drive more and take the train less in the immediately aftermath of a high profile railway accident. While not a single Japanese citizen will die prematurely from exposure to the trivially low doses of radiation to which those in the immediate vicinity of the Fukushima Daiichi plant were exposed, German’s decision will have deadly consequences for European public health and global climate change. 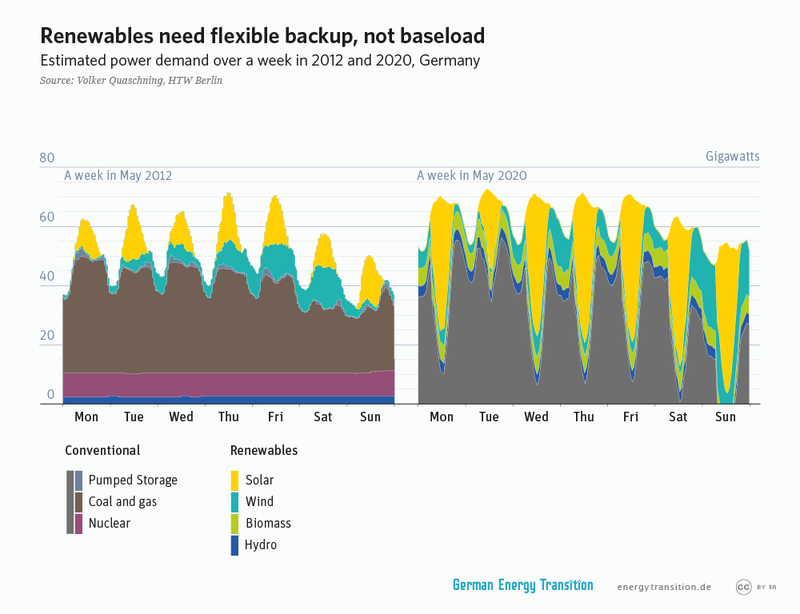 Germany can ramp up renewables as fast as they like, but for every nuclear reactor they take offline, that represents an equivalent amount of coal generation that could have been retired instead. Death rates (deaths per GWh) for coal exceed those of nuclear power by well over two orders of magnitude (citation: http://www.bigthunderwindpower.ca/files/resources/Electricity_generation_and_health_%28The_Lancet_2007%29.pdf). It is one of the great tragedies of the human condition that we can become so comfortable with the evil we know (e.g. poor air quality) yet so behave so irrational when contemplating the evil we don’t understand (e.g. radiation). Finally, there is the issue of cost. German retail electricity rates are insane, about 38 US cents per kWh for the residential consumer (http://www.eia.gov/todayinenergy/detail.cfm?id=18851). Unlike California, this is the not the top tier rate. This is the average rate. Half of the cost of those rates are taxes & fees to pay for the subsidies to renewables. Non-residential customers are shielded from most of these taxes, with an average rate of about 17 cents per kWh. There is no reason why the transition to the zero-carbon future should cost this much. Just look at France’s residential electric rates: 20 cents per kWh (after taxes), the cheapest in Western Europe, while consuming only a fraction of the fossil fuels that Germany does. Coal and natural gas have been the main source of energy since the industrial revolution. The norm is to combust it and exhaust it. We have looked at this and decided this is old school. This exhaust needs a purpose. Natural gas is simple. With the technology of Condensing Flue Gas Heat Recovery the heat energy can be removed / recovered from the exhaust. Utilize it either back in the building or facility where it was combusted or somewhere nearby. The cooled CO2 can either be purposefully used or it can be transformed into useful – saleable products with the technology, Carbon Capture Utilization System. There is in every 1 million Btu’s of combusted natural gas 5 gallons of recoverable distilled water and this water is very useable. Coal has more elements to deal with. As with natural gas there are already commercial products already in use. Coal ash removal with ESP is an expensive process as it consumes a lot of the produced electricity. We have developed an Ash Particulate Recovery System that is as effective that only consumes a fraction of electricity. With the Ash removed it then has to be utilized instead of being left in a pile. The Sulfur has to be removed along with the Mercury, separated and sold. The Heat Energy has to be removed and utilized and the CO2 needs to be Transformed into useful – saleable products. Waste is no longer a waste when is has a useful purpose. And when we incorporate the costs of those processes, those costs exceed the costs of renewables, so why bother? I noticed your second chart shows a 10% reduction in energy use from 2008 to 2020, while the 3rd chart show an increase in energy consumption from 2012 to 2020 (area under the curve is larger in 2020). Robert, thanks for pointing out that discrepancy. It is a graphics issue, not a policy issue. We are currently updating the charts, so I will point out this error to the agency. 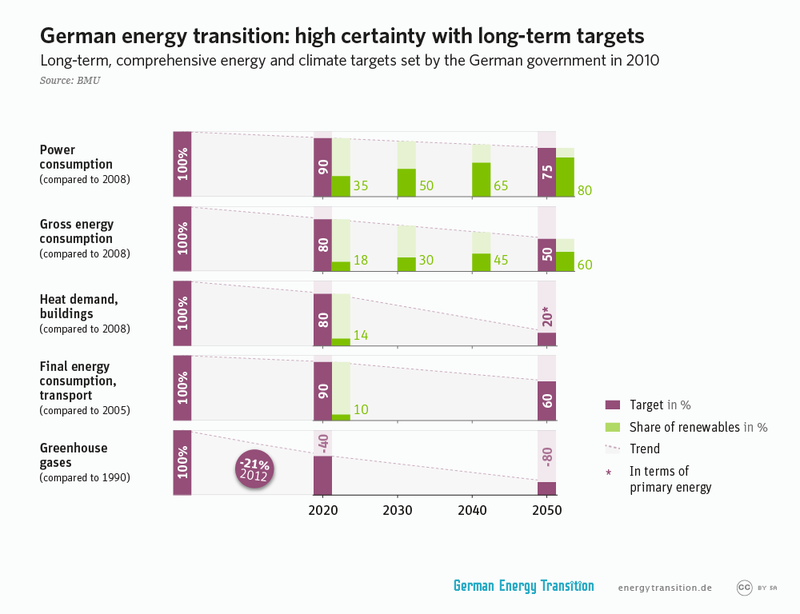 You spotted a graphical error in Energiewende’s graphs as pointed out in another comment. Good eye. Another great summary of ambitious German energy mission. Thanks Max. Yesterday our chancellor at least officially anounced to refrain from high penalties on carbon. Relevant for energy producers like us. Very. On the Battery: thanks to Elon indeed to bring this on the public agenda. Interesting that we from the German electricity industry have had the same product out for several month. Nobody cared. Proves again that it needs visionaries, and not technicians for a revolution. Happy to see where this goes now. Can you name some of the players from Germany who came up with similar home use batteries? I am curious why they did not get the media attention that Tesla got. The answer to why “nobody cared”: first of all none of the conventional players are being heard in their own country (stigma on the “bad evil 4”) second of all we (RWE, e.on, EnbW, Vattenfall) take the German word “Vertrieb” (should be translated “sales”, but can also be translated “scare off”) wrong and make just about any mistake you can make and use any opportunity to scare off customers. Second of all Tesla has a vision and is being heard. Many german companies lack vision. They are about business case. They are about gadgets. That’s my explanation – I may be very wrong. Energy Institute Blog Exiting Coal?